Rent The Highlands at Dove Mountain | Corporate Events | Wedding Locations, Event Spaces and Party Venues. 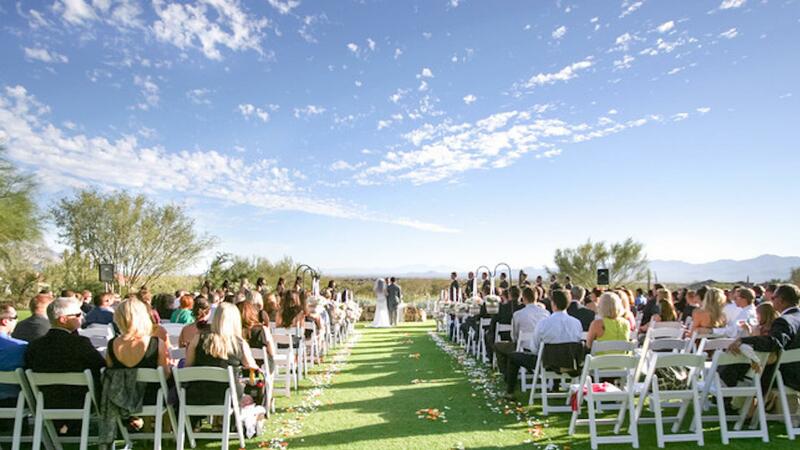 What lovelier backdrop for your Arizona wedding than a panoramic view of Tucson’s valley floor and the Santa Catalina and surrounding mountain ranges—an infinite view available exclusively at Heritage Highlands at Dove Mountain! With on-site food and beverage catering and bridal services! he Dove Mountain Ballroom seats up to 250 guests for a dinner or reception. It has a permanent dance floor, stage and an audio-visual system. For weddings, there is a Bride’s Room immediately adjoining. Round tables seat 8-10 people. Plated or buffet style dinners are available. Included are white or black tablecloths and napkins, tables and chairs, dance floor, use of house centerpieces (choose from a selection), jewel votives, tealight candles, china, silverware, glassware. A gift table, cake table, place card table and sweetheart / head table can also be set up for the event. The Patio on the Green seats 54-60 guests and adjoins the Lawn and The Highlands Bar & Grille. It has beautiful views of the Catalina and Tucson mountains. It has a full roof, misters, infrared heaters for year-round use, barbecue grill and a serving area for food and beverages. Linens, beverage stations for guests and either station or butler passed hors d’ oeuvres are also available. The Lawn is a favorite for wedding ceremonies, and for very good reason. It overlooks the Catalina, Tucson and other surrounding mountain ranges. At sunset the Catalina Mountains can turn an array of amazing colors as the moon crests over the ridge. The Lawn makes a spectacular backdrop for evening events. The Highlands Bar & Grille may be reserved on a limited basis. The Bar area seats 37 and the Grille area seats up to 84 guests. A gas fireplace and glass walls with etching of the Tucson Mountains separate the two areas. The Bar and Grille area overlook the patio giving it a nicely casual atmosphere.